"The closest I have ever felt to playing is mixing live, because you are part of the show and anything you do is obviously making a difference." A musical jack-of-all trades, bassist, songwriter, sound engineer and producer, Tony Newton has long been a part of the tight-knit, extended IRON MAIDEN family since he first broke on the music scene in a big way with his first recording band, DIRTY DEEDS, which opened for IRON MAIDEN on the U.S. leg of the X Factor tour. 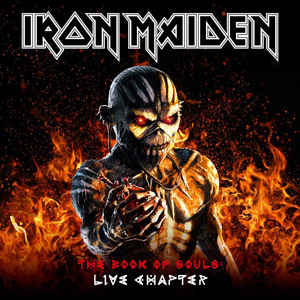 Eventually, since the late 90s, Tony has gone on to do multiple types of recording and production work for many artists, including IRON MAIDEN and his own current band, VOODOO SIX, which culminated with the recent co-production of MAIDEN's most recent Book of Souls: The Live Chapter album. Even as we speak, Tony takes a pause from setting up for live mixing a gig at a venue called Koko, in the bohemian Camden Town section of London, to talk about recent and past developments that make him unique in the business. 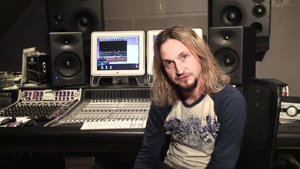 Topics include the current status of VOODOO SIX, his long-term sound work with IRON MAIDEN and affiliated acts, and some nuances of his many diverse jobs doing production and audio for recording and touring bands from England, the U.S., elsewhere. KNAC.COM: Hi Tony, great to touch bases again. Obviously you are setting up for a gig in Camden Town. What are the details? NEWTON: I'm recording a band this evening, an American band, actually, from Maryland. KNAC.COM: Oh, yes. I have heard of them. They are very Americana. Now tell me, in your text you had mentioned that Matt [Pearce, VOODOO SIX guitarist] and Joe [Lazarus, VOODOO SIX drummer], had come by your place for dinner yesterday. Were you guys talking about upcoming things happening with VOODOO SIX? NEWTON: Well, we were talking about doing some more recording this summer, for another album, and we've got a few ideas for that. And, we've just been offered a show, a festival, in Portugal for, I believe, July. Then we'll go out again later this year for a UK tour. So, there is always someting going on with us. KNAC.COM: Well I know your most recent album, Make Way For The King, was released last September, and you went on a UK tour when that came out. NEWTON: That's right, we did, yeah. KNAC.COM: And it's still a new album, really. So, of course I wonder whether you are thinking about touring for it in the U.S. again with VOODOO SIX. NEWTON: Well, we'd love to, but the expense is the thing. As you know, now the labels really don't really put much into tour support, so, it would have to be self-funded, if we did it, and it is very difficult to fund us being away for that period of time. Definitely, in the UK, if it is anywhere around the London area, we can come home. But obviously if we go to the US, every night it's a hotel, and it just racks up with the visas ... But we'll still look at it, we'll still work at it, and look at options as a support [band]. I'd love to do it! Because I think, to be honest, musically it's more suited to America than the UK. I always thought that from the start, that it had that sort of sound about it. So, we'd love to come over! KNAC.COM: Regarding the most recent album, Make Way For The King, it has received great reviews in the UK, but it looks like almost all of the actual recording was done in L.A. Is that right? NEWTON: Yeah! We recorded it in the Mothership Studio - actually Steve Vai's studio - and it was fantastic. A friend of mine helped me produce it: Tom Fletcher. He's done loads of things if you check him out. He's done No More Tears by Ozzy Osbourne, he's done ASIA and Yngwie Malmsteen ... Jeff Beck. He's just done loads and loads of stuff. When I lived in LA - 15 years ago or more now - I hooked up with him and he kindly let me sit through a lot of sessions that he was working on in the studio, and I got a real big insight into the productions and mixing through him. He was very kind - a lot of people don't like to show their secrets but welcomed me in and was only too happy to let me be there. And just watching was a massive learning curve for me, you know? KNAC.COM: Uh-huh. I do remember you having a long-time recording relationship with him from other times that we've discussed these things in the past. KNAC.COM: For that album, didn't Joe and Matt come out there for parts of that? NEWTON: Yeah, we all did. We all went out. We recorded everything there. The four of us just recorded everything live in two weeks - and with the new singer. It was great. KNAC.COM: Well, it sounds like you had all the new songs put together pretty solid before you went there. NEWTON: Yeah, yeah. We put them together just at home - we did demos and stuff. Then we went in for a couple of rehearsals before we left, and jumped on the plane the 2nd of January. We were all together and we had a great time, and I think we came up with a something we were really pleased with. KNAC.COM: I know people may wonder about the title of the album -Make Way For The King - and there was also the song with the same title. What inspired that concept? NEWTON: It's funny really. Lyrically it is really about Elvis Presley - The King. If you read the lyrics, there's some funny little lines referring to that. He didn't want to be known as The King; he just wanted to be a regular guy. It was based around that sort of idea. KNAC.COM: Well, how did that songwriting work out? Who did the lyrics, for example? Who did what? NEWTON: Musically, I generally do everything, but Nik [Taylor-Stoakes, new VOODOO SIX vocalist] - he probably did 80 percent of the lyrics with me. He had some great ideas. Normally, if you're writing with someone, and they're struggling a bit, you have to help by talking things out. But, I really didn't have to do that to much with him. I'd already had a few ideas for songs - choruses and stuff that we used. KNAC.COM: Well, how did you connect with Nik after Luke [Purdie, prior VOODOO SIX vocalist] left? NEWTON: The label we were with in the UK - we were signed to Universal - we were due to submit a new album to them, but I had to tell them, obviously we'd lost our singer. He wasn't going to continue with us, and I just said, Look, if you know someone ... And there was this band, and they sent us some music, and it was really different, but I really liked his [Nik's] voice. Then we went to see them. We didn't care too much for the band but the singer was fantastic. We were looking at other stuff from other people, but every one of us, went 'That guy is different; I think it'll work.' So we got Nik in, and we actually did two shows with him before he was in the band. He just helped us out, because we were comitted to those two shows, and they were quite big shows. One was a festival and one was a big London support to ACCEPT. It was a great way of getting to know each other and also seeing what he was like onstage as well. And it worked out great; he really is a big member of the band. He came in and grabbed it with both hands; he really enjoys it, and he's a really nice guy to be around, so that helps. KNAC.COM: Especially because that was a very difficult time. NEWTON: Yes, because Luke became ill and couldn't continue. To be honest with you, I was at a point where I didnt want to continue with it. I was really, really down. KNAC.COM: I'm not surprised, because I was shocked when that happened, too, after everything had been going so well. NEWTON: But then Nik came along and it gave us all a really big shot in the arm - to do another album and go again, you know. KNAC.COM: Well, I wondered, because I know when Luke left that it must have been such a kick in the gut. NEWTON: Yeah! Well, it was. Because that voice - Luke - that was the voice I had been looking for, but I just couldn't find it initially, so that is why we went with the first singer [first VOODOO SIX singer Henry Rundell], because he was a good singer although he wasn't exactly what we wanted, but we just wanted to get out and play. Then, you know, Luke came along, and That's It! - I thought, that's what we want. And he was the greatest guy with a great voice. But, unfortunately, he's not able to tour anymore, so we had to decide what we wanted to do, and Nik was a big part of us all wanting to continue. KNAC.COM: Switching gears now - you produced the most recent IRON MAIDEN album, Book of Souls: The Live Chapter, with Steve [Harris]- and you've done so much mixing and other sound work with MAIDEN over the years - but, to my knowldege, that seems like the first time you've gotten a production credit. NEWTON: Yes, it is, yeah. Obviously I've recorded lots of stuff before but, as for production, this is the first time I had a chance to do everything, really. So, obviously, I was very proud of that. KNAC.COM: Where did you physically do that? Did you do it in the UK at home? NEWTON: Well, there was a number of things. Of course there was the recording of the shows in the first place, and then I was asked about doing the album, and when I was told it was going to be songs from different shows, I spoke to Steve about it, and it was finding the best shows, not only in terms of the band performance, but the crowd as well. We were looking for which was the best for each song, and obviously, I'd do a rough mix of it and send it to Steve. He'd either go, Yes, that sounds great, or, No, let's look for another one. There were 72 shows to choose from! So, it was a lot of work there, just finding the right one, and then obviously, once that's done, stuff needs editing because there's lots of background noise from live because you have to cut out the mics when they're not being used for mixing, so there's lots of editing to do, then mixing, and mixing the final thing. So, it was a long process, but I enjoyed every step, actually. And right away, the first mix that I was doing, Steve really liked. I've mixed with him before, but not for this kind of release - something very important, but there was very little that was changed from the mixes I was playing him, so it was a very, very easy process for both of us. It was great! KNAC.COM: I know you've been on most of the recent tours, and that you're involved with varying aspects of the sound for live recordings or live videos, is that correct? NEWTON: Yeah, Yeah! Well, it depends. For the tour that this album was recorded from, I was actually doing the sound for THE RAVEN AGE [the melodic metal band that features Steve Harris's son George Harris on guitar], which were the support band for the whole tour. So, I was doing the live sound for them, and I was recording MAIDEN. But, I generally don't go out on the whole tour. In the upcoming tour, I'll be going out for the odd gig, but I'm not needed to go out on the whole tour. KNAC.COM: So, do you think you will do more actual production going forward? NEWTON: Yeah, I have been. I've been doing a little bit this year; I've already recorded six albums this year for other people. I've done one production this year where I've worked with other producers as an engineer and mixing and stuff, so, yeah, I'm always heavily studio involved with something. 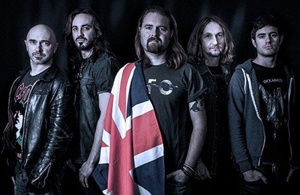 KNAC.COM: Does the production you are doing involve mostly UK bands? NEWTON: Yeah, well the most recent one - I haven't mixed it yet, but I've recorded it - it's a band from Cambridge in England called THE TREATMENT. I think they did actually tour the US with KISS and MOTLEY CRUE a few years ago. I think this will be their third or fourth album for them. And there's another band that Jason Bonham was in originally; they're called AIRRACE, and I'm just recording and mixing that one. Then, I'll produce a band called MONUMENT, who're a UK-based metal band. And I think that comes out ... this month! And also, I do live mixing as well. 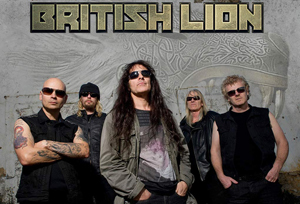 You know, I've been out with Steve Harris's BRITISH LION. We did some dates and we did a Monsters of Rock cruise this year in February from Miami. KNAC.COM: Yes, How did you like that? NEWTON: Yeah, I loved it. We all did; it was really good. And there were some really great bands on there ... And then last year we did quite a long stretch with BRITISH LION in Europe, at festivals and this and that. And, I've been recording BRITISH LION as well - their next studio album. I'm basically recording and producing that one. KNAC.COM: Oh, is that one nearly finished? NEWTON: It's mostly done. I've just got a few little bits to finish, and we're going to complete the mixes next month. So, hopefully it will be out later this year. KNAC.COM: Where do you physically do most of your recording, mixing, or production work? 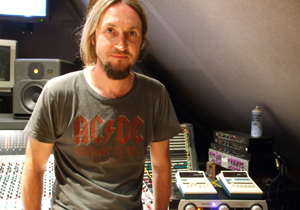 NEWTON: Well, for some bands I use Barnyard Studios, up in Harlow, which Steve owns, where MAIDEN recorded back in the day. And that's quite close to me, but I just use anywhere a band wants me to. But mixing-wise, if they ask me to mix, I will generally see if Barnyard is available, because George, Steve's son rehearses there [with THE RAVEN AGE], so I generally check to see if he's not using it. So, there's not any one studio, but that would be me preference because it's where I live. (laughs) That's the only reason. KNAC.COM: And you are out with a band that was touring a couple of weeks ago and also another band tonight. What roles do you play with those? NEWTON: Yeah, last week that was TOSELAND, and I was doing the live sound - the front of house mixing. They're actually a lovely band. The singer [James Toseland] was the World Superbike Champion, but in 2011 he had a fall and broke his wrist and had to retire. So, he played keyboards and sang since he eight years-old, so he decided to go fully into that. They're a really good band and nice guys, so it was very enjoyable to be out on the road with them. KNAC.COM: So, you fit in those kinds of jobs - like live sound on touring gigs - between what you're already doing? NEWTON: Yeah, exactly. I like variety and I like going out on the road sometimes. It's quite nice. For me, obviously, I play music, and the buzz of playing on the stage, the studio could never re-create that. But for me, the closest I have ever felt to playing is mixing live, because you are part of the show and anything you do is obviously making a difference. That, to me, is really exciting. I like that now and again, and mixing it in with the studio work. NEWTON: Well, you know, they are related. Obviously, the playing is different, but, as for the recording and mixing, it's still using your hands and your ears to adjust things. It's just a different medium there, but, at the end of the day, you're just trying to make something sound as good as you can ... And, I enjoy that. And also I like doing varied music; I don't like to just do metal - I like doing different stuff. I think you learn things then, that you can then bring back into different genres. KNAC.COM: To tie things up, when you look ahead, what is your outlook and big picture for the rest this year, or at least the foreseeable future? NEWTON: You mentioned MAIDEN, and I'll be going out a couple of times on the European tour, and I've still got quite a lot of albums to finish - I've just mentioned THE TREATMENT and AIRRACE, and obviously the BRITISH LION one will need mixing in the next 2 or 3 months. So, that will keep me busy. In September I'm taking a bit of time off because I just bought a house in Florida. Then we'll see what comes after that!